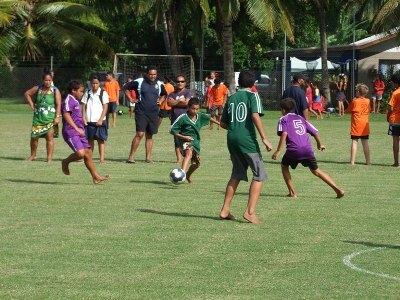 Avarua, Arorangi, Nukutere, Avatea, Te Uki Ou, Imanuela, Papaaroa, Titikaveka and Nikao will battle it out on the field in both girls and boys division to see who will rein this year’s Primary School Soccer Tournament. Both the boys and girls divisions schools are split into two groups where they will play each school to determine which school will go through to the play offs before heading to the finals to determine the winner. Avarua School won the first Senior Primary School Soccer Competition in the boys and girls division when it first kicked off in 2009; however Nikao stole the limelight in the boys division against Avatea last year to take the title while in the girl’s division Avarua School retained their title for another year. The vocal support from teachers, parents and supporters will without a doubt boost the students to play well and confident for a win for their school team.